Every year the Chinese community at my work place organizes a grand camping trip to a location near Ottawa. Murphy’s Point Provincial Park was chosen for this year. Unlike Algonquin Park, Murphy’s Point is more of an recreational park. 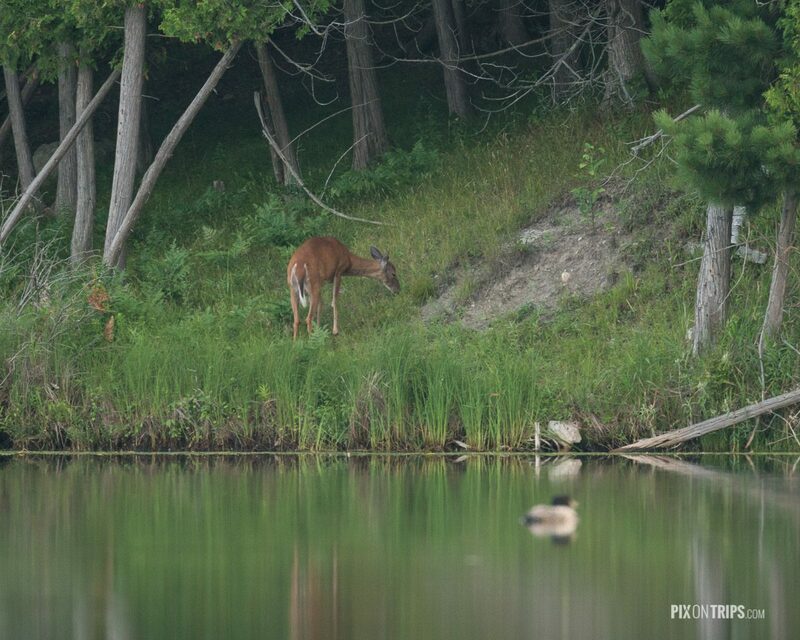 That being said, there is no shortage of opportunities for nature photography. 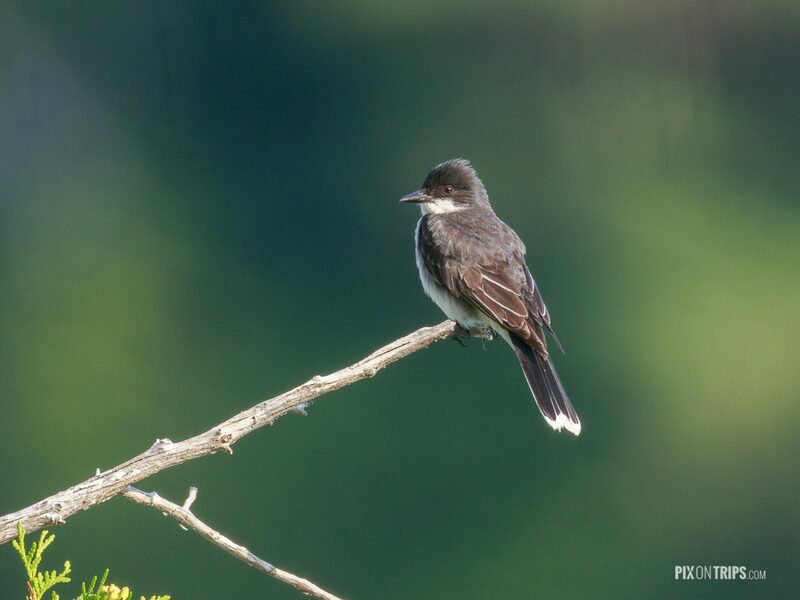 My main goal in addition to having fun and enjoying fantastic camping banquet is to practice what I learned from reading “The Handbook of Bird Photography”, a book by Bence Máté, Jari Peltomäki, and Markus Varesvuo. Rule #1: let birds come to you. I was up before 5:00AM Saturday morning. 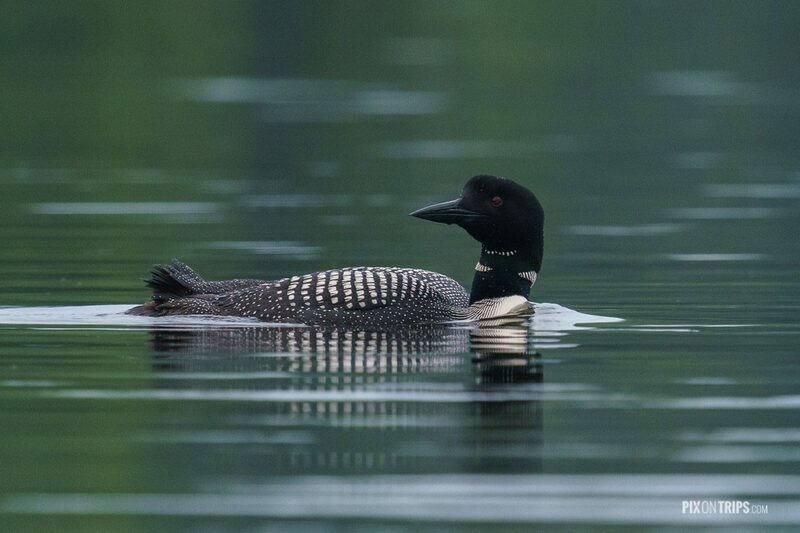 Before sunrise I was hiding in the bushes by the shore of the Loon Lake camouflaged. 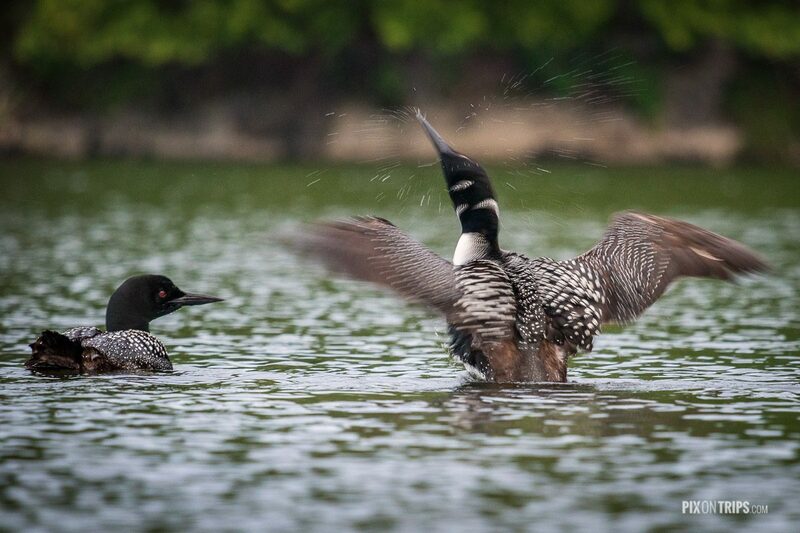 Two loons were swimming in middle of the lake. Most of time they were too far away from me. Occasionally, one of them got a little close. Took this profile shot before 6:00AM. It was not bright enough. I had to crank up ISO to 1600. Sony A7rII has very impressive high ISO performance. A deer came into sight while I was waiting for some interesting moments. A welcome company. 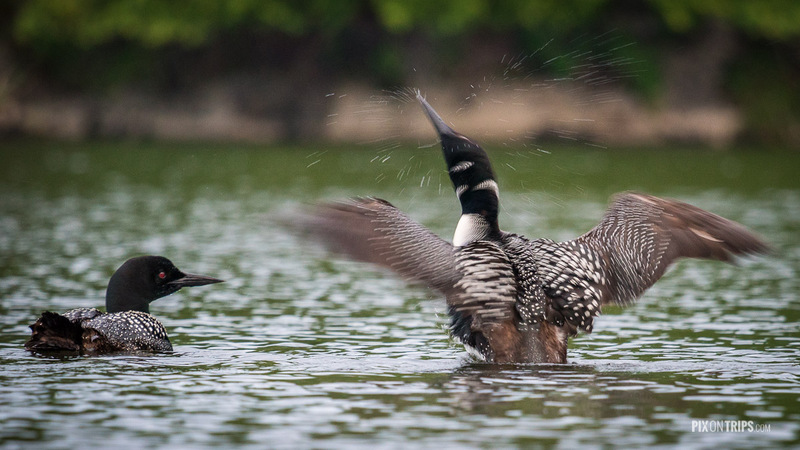 Missed a shot when one of the loons took off with wings flapping on the water. It was a beautiful scene. 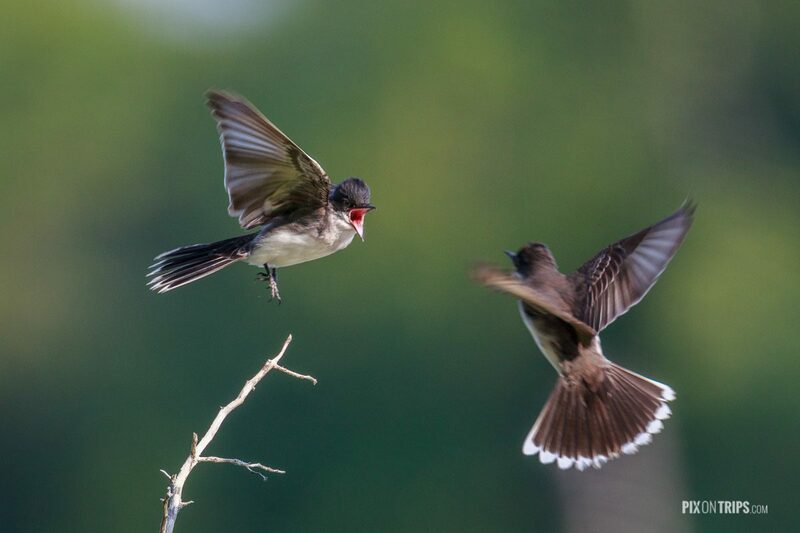 After the loon is gone, I saw a group of eastern kingbirds sally out for insects on the surface of the lake. They always return to their favourite branches. 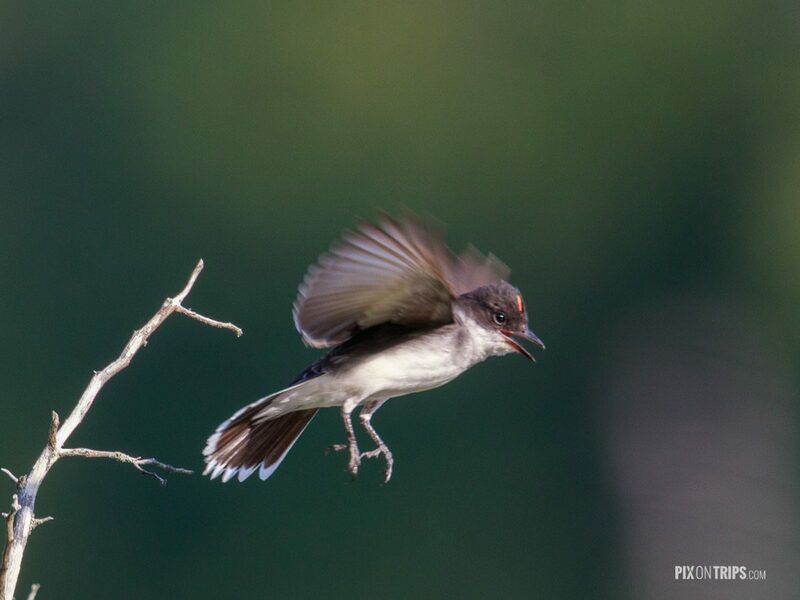 I pre-focused on the branch and set the camera in continuous high speed mode . 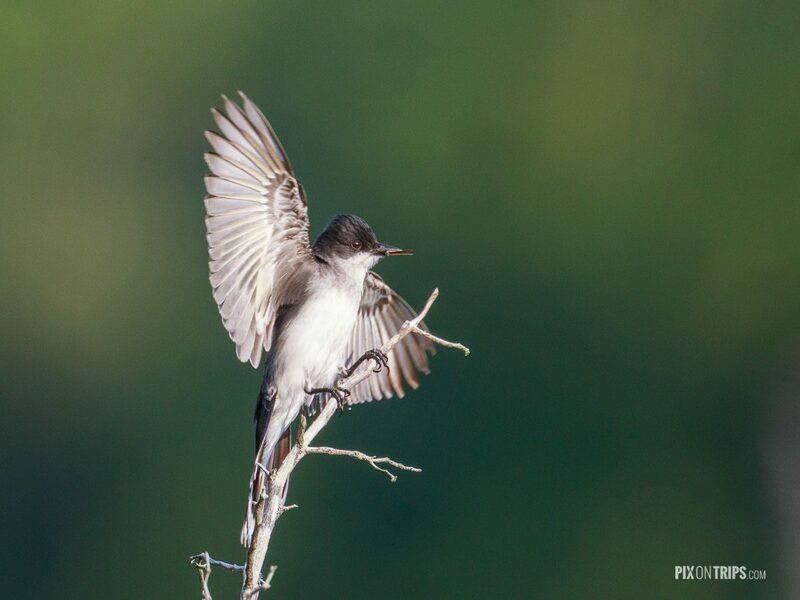 Before the bird landed, I pressed and held the shutter button to take multiple shots. Sun was coming from the right, so was the wind. At 7:22AM, the light was still soft. 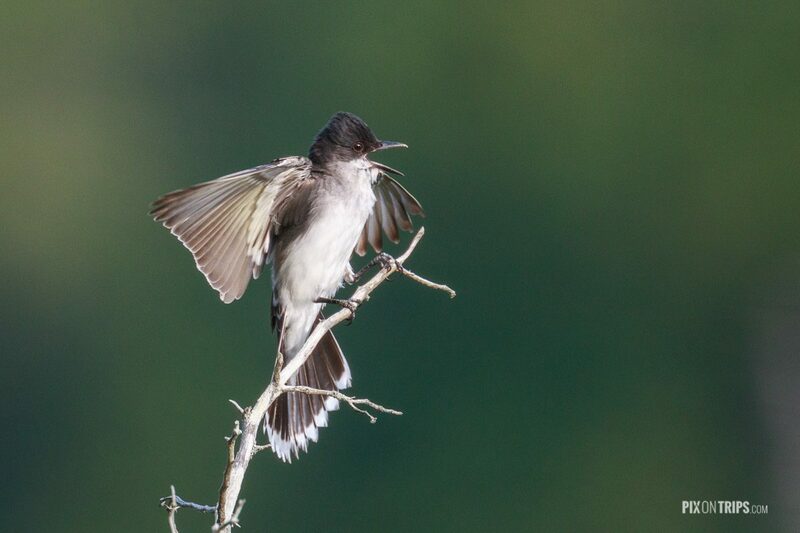 Here is a male eastern kingbird in flight displaying its red median crown patch. 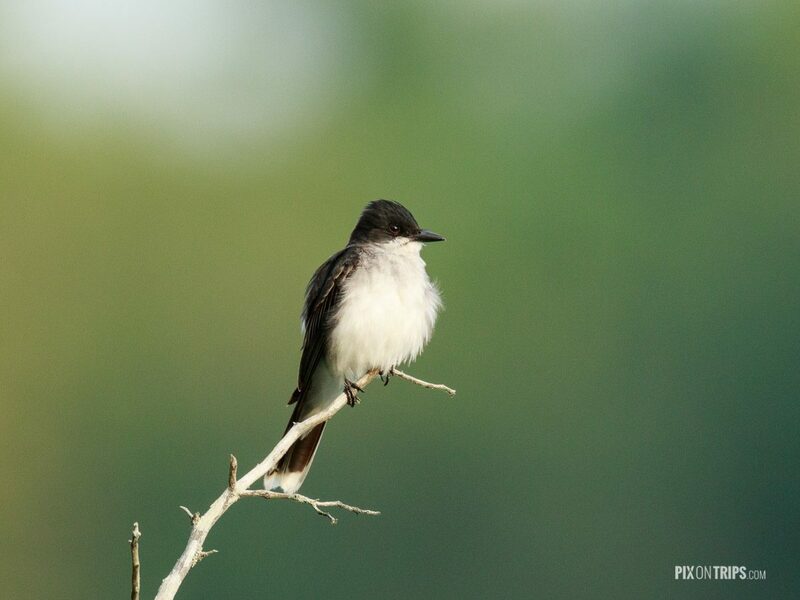 A beautiful little creature deserves another shot from a different angle. 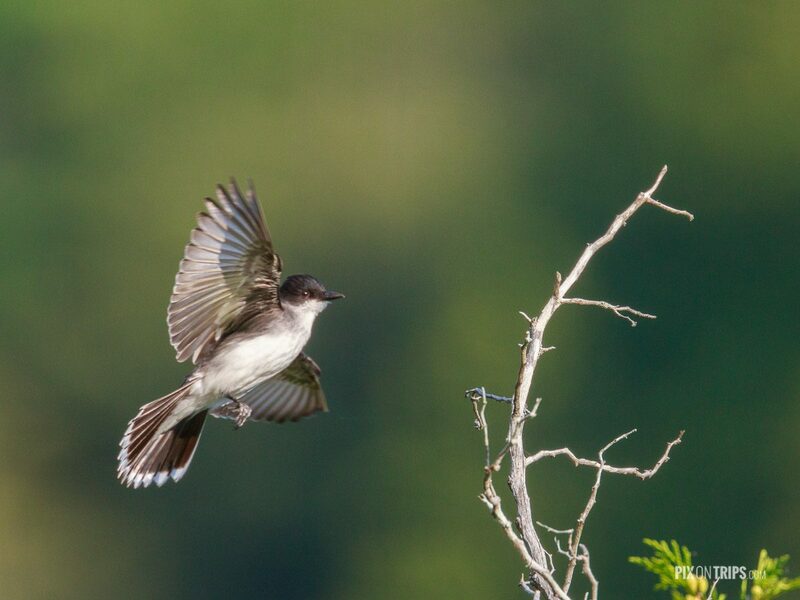 I had lots of fun shooting the kingbird in flight and landing. 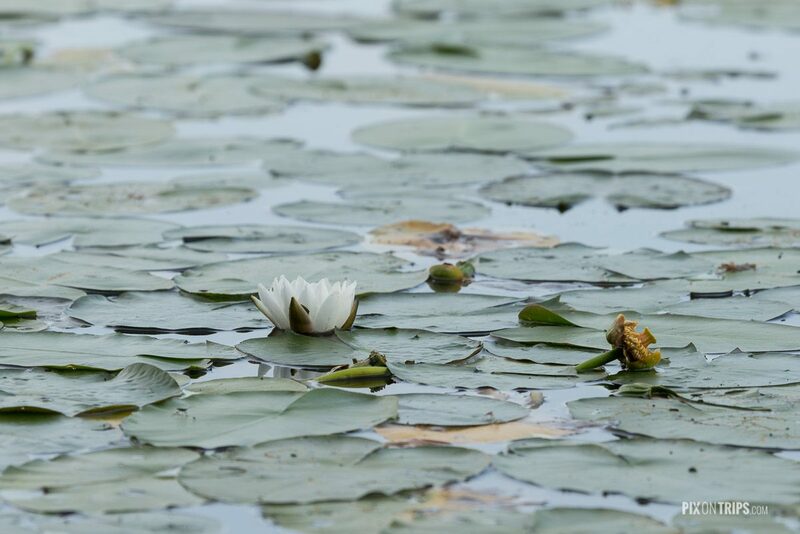 The water lily and lily pads were where the kingbirds found the insects. After dinner, wife and I were paddling a 2-person kayak at the Hogg Bay. 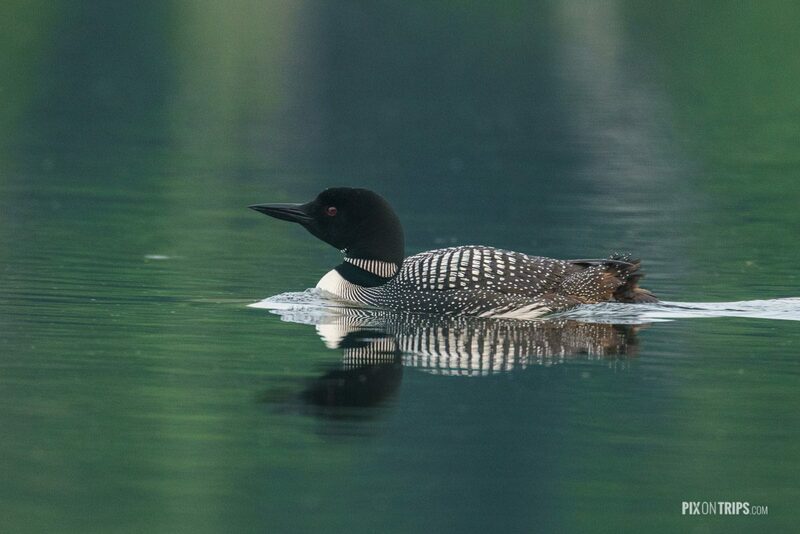 The kayak allowed us to get closer to the loons. This is one of my favourite shots of this trip. 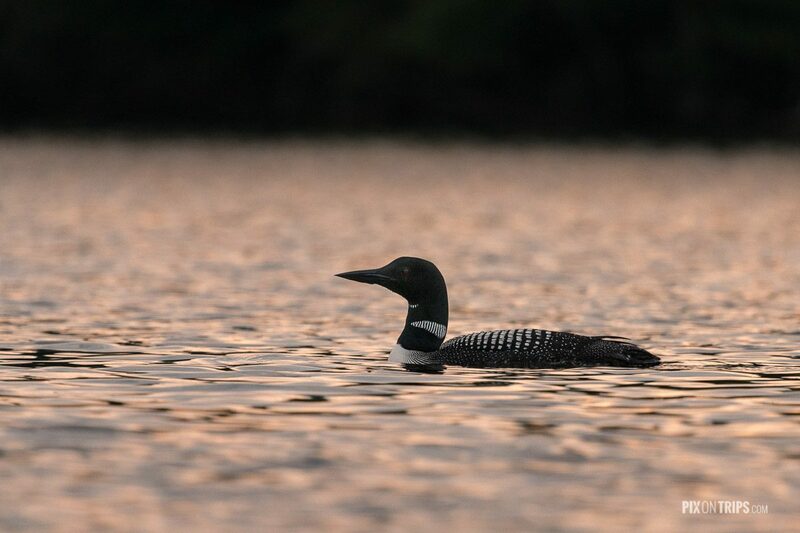 At dusk, I took one last photo of the loon.